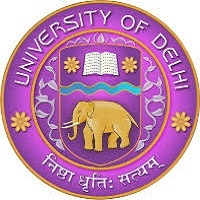 Delhi University application process can be started from 15th April 2019 (Tentatively). Click Here to apply online. (B.Com) Honors Should have passed HSC (10+2) examination with at least 45-55% aggregate in marks. For scheduled caste students, 15 percent of the total seats are vacant. For the scheduled tribe (ST), it is 7.5 %. Reservation is 3% for PWD. Reservation is 3 % for girl students. Based on the merit drawn on the basis of entrance test and interview/GD, admission is carried out in the Delhi University. The 85% weightage will be provided to the Entrance test and 15% weightage to GD and Interview, for admission to BMS/B.A. (Hons.) Business Economics/BBA (FIA), etc. Before filling the application form, candidates must have to read the instruction carefully. The online application form will be issued from the website. The answers have to be marked on the Optical Mark Recognition (OMR) sheet. There will be separate subjects from which the questions will be asked, for each course. The question paper for UG and PG courses will include objective type questions. For UG courses, 4 marks will be credited to each correct answer and 1 mark will be deducted for each incorrect answer. Admit card download link will be available in May 2019. It is important to take the Admit Card with you while going to the examination center. The candidate has to bring one identity proof along with the admit card. The result will be declared in the July 2019 tentatively. By considering candidate’s performance in the entrance exam and interview/group discussion, merit list will be drawn. The category wise cutoff for different engineering branches in different colleges affiliated to Delhi University will be officially published by the officials on the respective website of the university. Candidates are advised to follow the syllabus as prescribed by the University. The syllabus for UG courses will be basically based on the 11th and 12th standard. For PG courses, the syllabus will be of graduation level of Delhi University. I want to join for BBA in du +12 marks is 89.5% I’m from science background. how to get addmission please tell me fast..